Do you need to explain your Scrum process to new hires, new teammates, or to others outside software development? 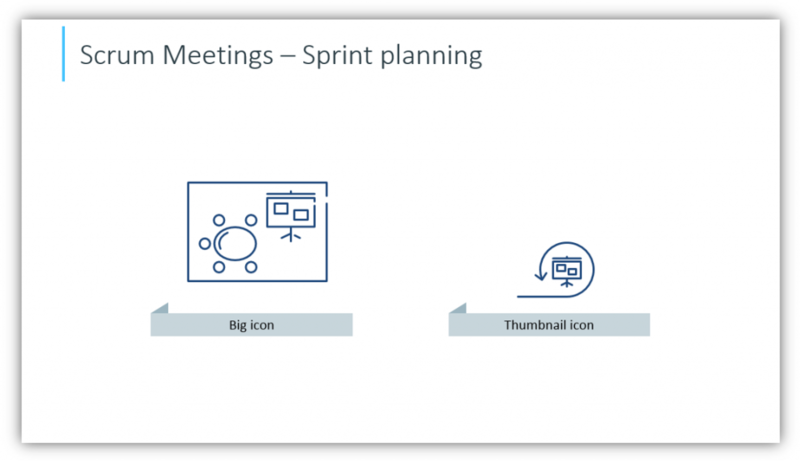 By using diagrams and common Scrum artifact symbols, you can illustrate concepts for a training presentation or assemble a slide deck for an agile project management meeting. Explain Scrum methodology from the ground up in modern presentations using easy to follow graphics. 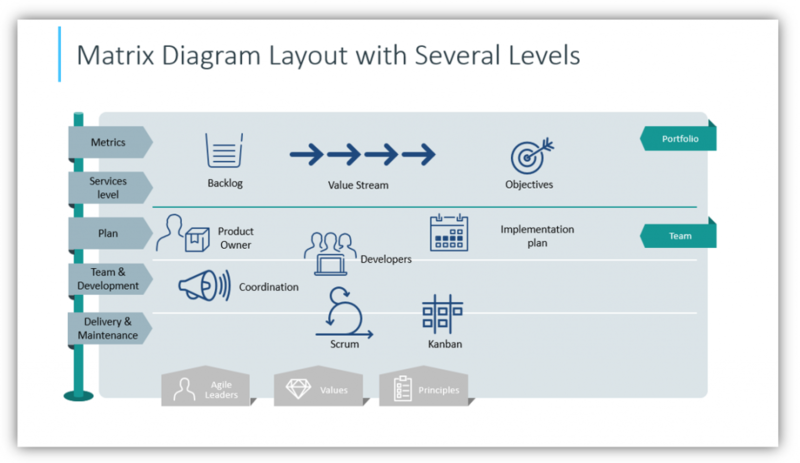 The scrum graphics we present here comes from the commercial Scrum Outline Presentation PPT Template. Explain the roles in Scrum methodology and the different steps and phases of the process. Show the audience what role they play in the process by highlighting where they fall, and explaining how their part is essential. You can choose to use outline icons with thick or thin loops, as well as customize colors to better represent your audience, brand, or project. Software development is rarely a one level process. Show your trainees or other audience members how Scrum fits into the process, and what other components are involved. You may modify the labels to match your organization and change the icons to be a better representative of your processes as a whole. Modify line thickness, colors, and labels to suit your needs. Change the icons and customize the legend to ensure your meaning is clear to your audience. Add as much or little description as is necessary based on your audience’s experience and familiarity with the material you’re presenting. 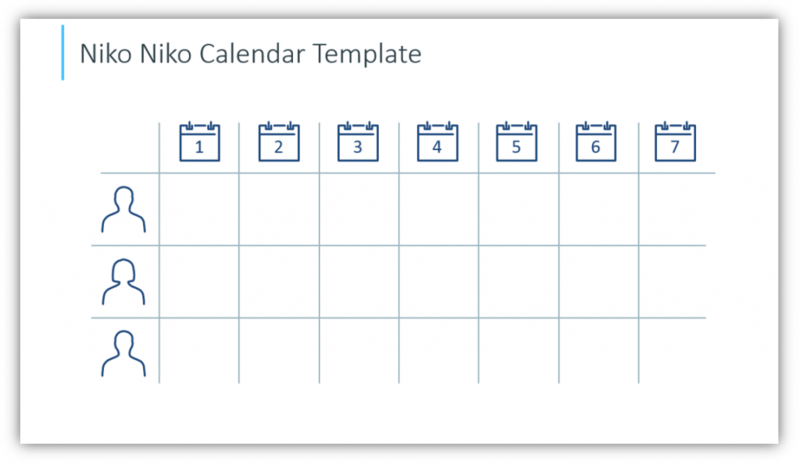 Does your team utilize a Niko Niko Calendar? Explain it in your presentation so your trainees will know what you expect of them. 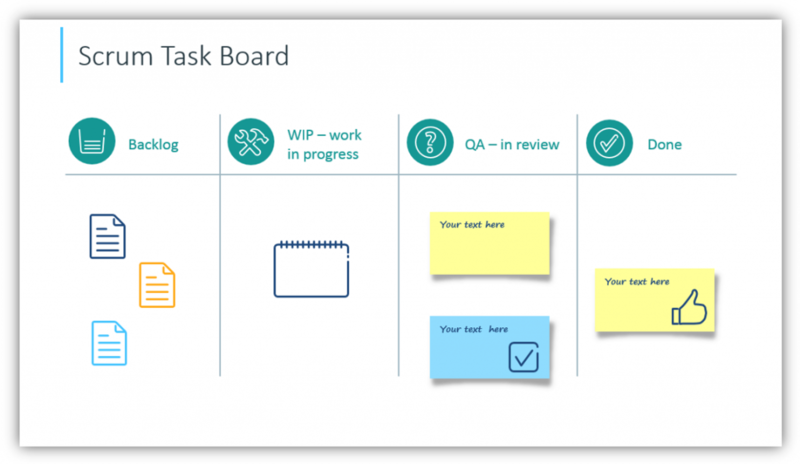 Detail your Scrum task board and the different components so your trainees will understand your requirements. Be sure to explain anything about these processes which is unique to your organization or which is done differently between teams, so that everyone is on the same page. 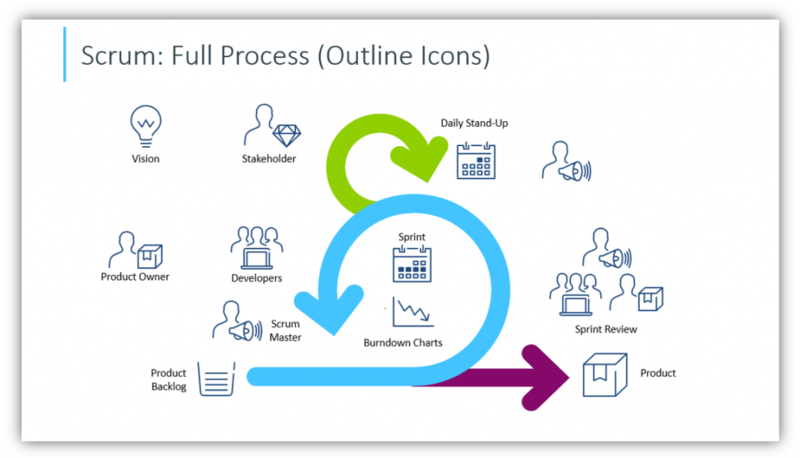 Once you’ve explained what spring planning looks like or what Scrum meetings entail, you can utilize icons like these to represent them in your timeline. Whichever style of design you choose, both can be incredibly effective at helping you minimize the amount of text on your slides. This will keep your presentations from being overwhelming but will allow you to provide a lot of information in a short span. 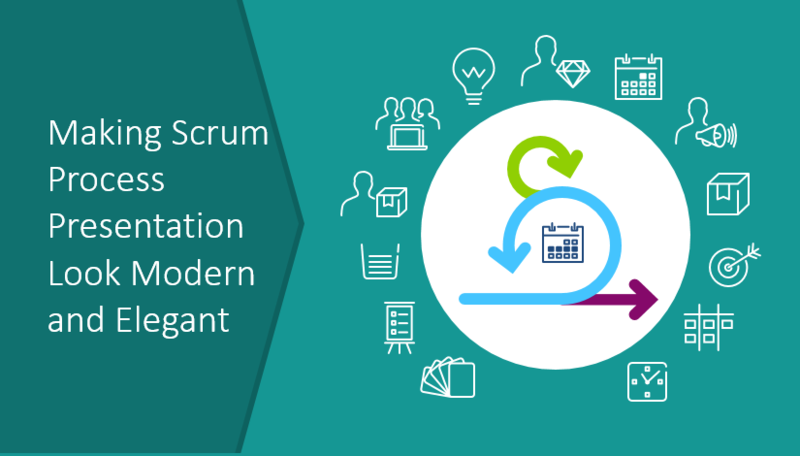 You can explain the full Scrum process and show how it fits into your organization. 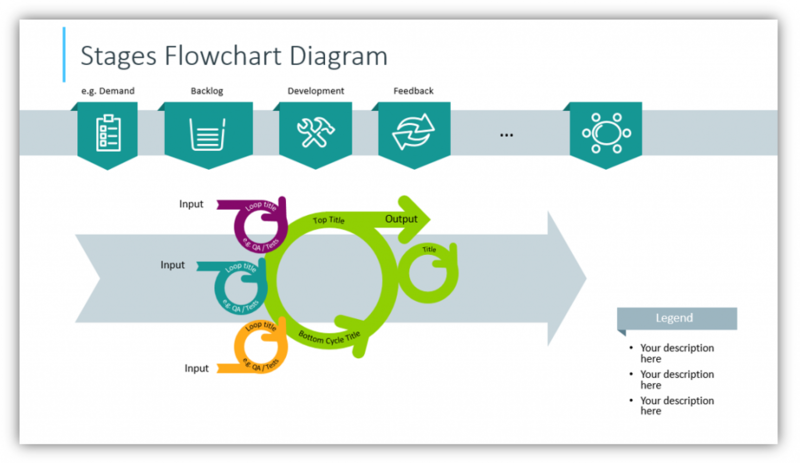 In addition to using process loops, you can utilize flowchart diagrams to explain stages and tables to break down Niko Niko calendars and your scrum task board. 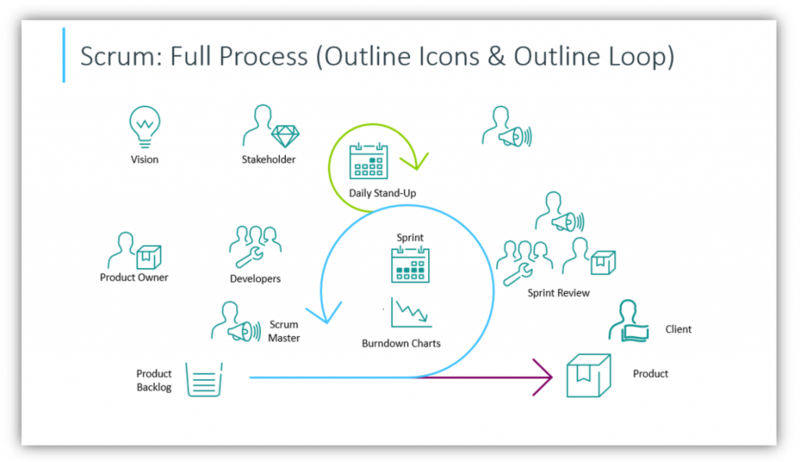 When you use customized symbols and icons, you can provide your audience with a simple to follow, easy to retain explanation of Scrum processes and expectations. Recoloring each loop and element in the Scrum process will help you isolate and explain each part. You may add shadow, change line thickness, modify colors and further customize the icons to help you share your message. Match your brand, coordinate with a recent launch, or simply design something meant to resonate with your audience in particular. If you are looking for more IT-related topics, take a look at IT and scrum graphics category.